Without God’s help and without support from TheDream.US, I never would have been able to attend the University of California at Berkeley. Instead, I would have been stuck working a low-paying job I did not enjoy. But because of this scholarship and my faith, I am able to chase my lifelong dream of becoming an astrophysicist. Ever since I was a small boy, my dream has been to work at NASA. At the risk of sounding cliché, this scholarship has given me the opportunity to shoot for the stars. I have lived and grown up in America since I was six years old after moving from El Salvador. The hardest part of adjusting to the United States was attending school for the first time. I began going to school for the first time when I was 7 years old. In my first grade class, I was the oldest student and I did not speak any English. I wasn’t that bad at math, but the language barrier seemed impossible to overcome. I finished the year as one of the lowest performing students in the class. After that year, I made a promise with myself to never feel academically left behind again. The rest of elementary school was a period of intense academic and personal growth for me as a student and person; I’m not sure that is how most kids describe elementary school, but my childhood was obviously a lot different from most. By sixth grade, I was one of the top students in my class. I continued to grow academically, challenge myself, and never settle for mediocrity. I graduated as the valedictorian in my middle school class. In high school, I enrolled in every Advanced Placement class available to me and continued to push myself. I then graduated as the valedictorian of my high school class, too. During my senior year of high school, I did some research on UC Berkeley and discovered it is considered by many the number one public university in the world. It quickly became my first choice. Throughout high school, I participated in Junior State of America which is a national club focused on discussing current political events, and College Match, an organization that helps high school students apply to and prepare for college. It was through College Match that I learned of TheDream.US scholarship opportunities. My sister and I are both DACA recipients; thanks to DACA we have been able to pursue higher education as first-generation college students. A society made up of people with a high education is a society which has the best potential of being fruitful and successful. Higher education for DREAMers is especially important because DREAMers like me usually come from poor and struggling cities and neighborhoods, which are often made up of minority groups disproportionately lacking in education and legal status. 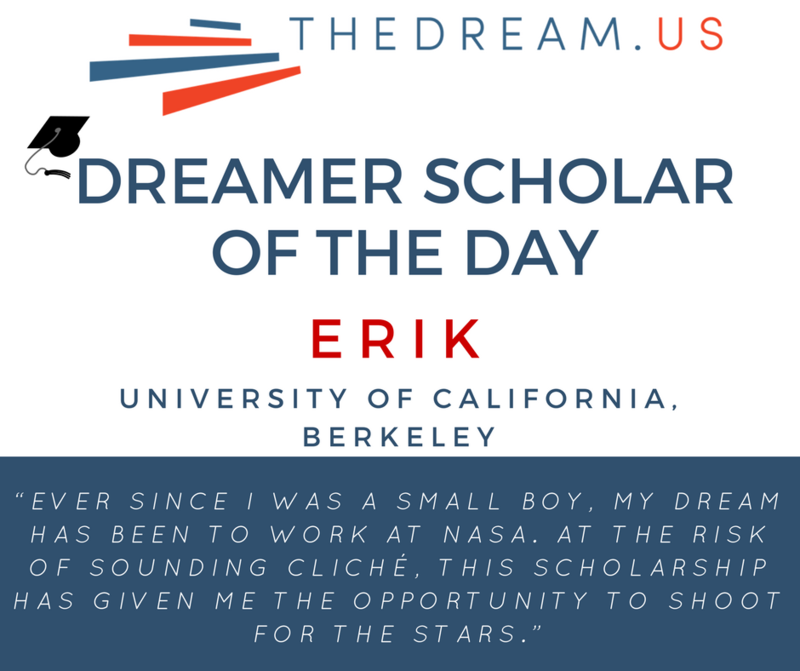 DREAMers that receive a higher education then have the potential of giving back and improving the cities and societies from which they come from. My advice to other DREAMers is to have faith, stay positive, and keep dreaming big.